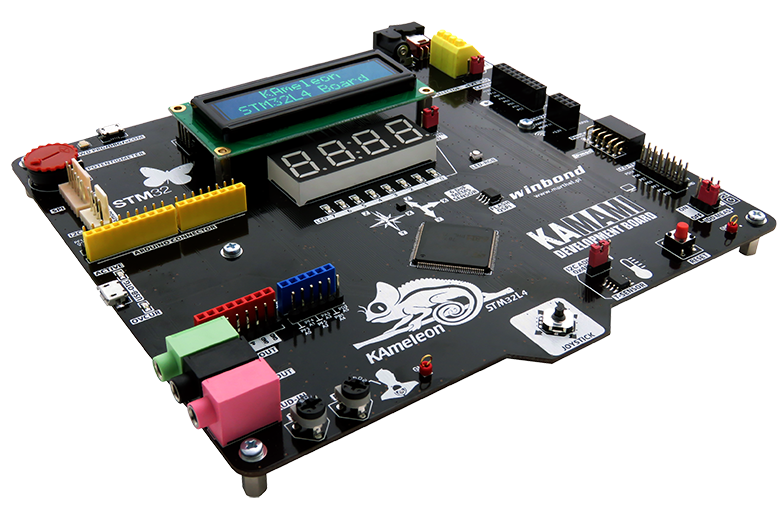 Kameleon Board not only has fast low-power ARM microcontroller, it also features built-in programmer/debugger, MEMS sensor, temperature sensor, motor driver and many other. Check here all awesome Kameleon features. You can use Kameleon STM32L4 Board out-of-the-box, just install ST-Link driver, install IDE and connect the Kameleon STM32L4 board to your PC. Board is equipped with ST-Link programmer/debugger that is supported by all major ARM IDEs, including Keil µVision and Atollic TrueStudio. Go to How-to-start for more informations. We provide C library for peripherals available on Kameleon STM32L4 Board. Library includes sample projects showing how to use them. Library lets you use powerful STM32 microcontroller with ease similar to the one known from Arduino boards. 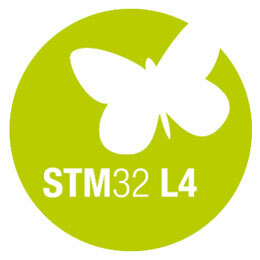 STM32L4 is a series of ultra-low-power MCUs by ST Microelectronics featuring a new architecture to reach best-in-class ultra-low-power figures thanks to its high flexibility. It delivers 100 DMIPS based on its ARM® Cortex®-M4 core with FPU and ST ART Accelerator™ at 80MHz. STM32L4 microcontrollers offer dynamic voltage scaling to balance power consumption with processing demand, low-power peripherals (LP UART, LP timers) available in Stop mode, safety and security features, smart and numerous peripherals, advanced and low-power analog peripherals such as op amps, comparators, LCD, 12-bit DACs and 16-bit ADCs. 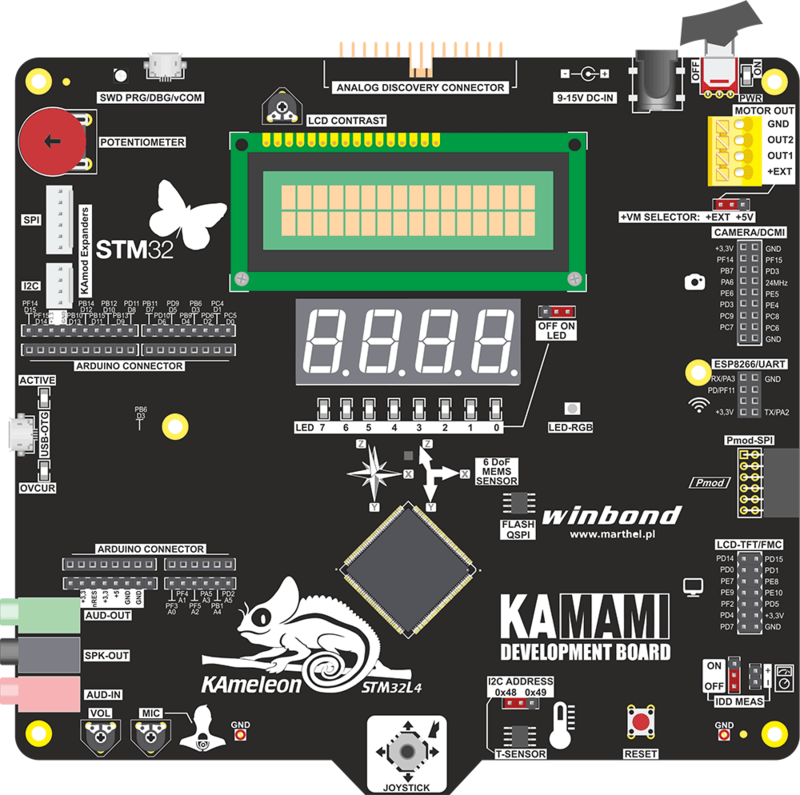 All these features make STM32L496Z the best choice for the ultimate and powerful board for microcontroller programming enthusiasts - the Kameleon Board. Click board element to find out what it is. The LSM303C is a system-in-package featuring a 3D digital linear acceleration sensor and a 3D digital magnetic sensor. The LSM303C has linear acceleration full scales of ±2 g / ±4 g / ±8 g and a magnetic field full scale of ±16 gauss. The LSM303C includes an I2C serial bus interface that supports standard and fast mode (100kHz and 400kHz) and an SPI serial standard interface. The LSM303C is available in a plastic land grid array package (LGA) and is guaranteed to operate over an extended temperature range from -40 °C to +85 °C. The ST1S10 is a high efficiency step-down PWM current mode switching regulator capable of providing up to 3A of output current. The device operates with an input supply range from 2.5V to 18V and provides an adjustable output voltage. It operates either at a 900 kHz fixed frequency or can be synchronized to an external clock (from 400kHz to 1.2MHz). The high switching frequency allows the use of tiny SMD external components, while the integrated synchronous rectifier eliminates the need for a Schottky diode. The ST1S10 provides excellent transient response, and is fully protected against thermal overheating, switching overcurrent and output short-circuit. The ST1S12 is a step down DC-DC converter optimized for powering low-voltage digital cores in HDD applications and, generally, to replace the high current linear solution when the power dissipation may cause high heating of the application environment. It provides up to 0.7A over an input voltage range of 2.5V to 5.5V. A high switching frequency (1.7MHz) allows the use of tiny surface-mount components. The STSPIN250 is a single brush DC motor driver integrating a low Rds(ON) power stage in a small VFQFPN 3x3mm package. The full-bridge implements a PWM current controller with fixed OFF time. The device is designed to operate in batterypowered scenarios and can be forced in a zeroconsumption state allowing a significant increase in battery life. The device offers a complete set of protection features including overcurrent, overtemperature and short-circuit protection. The digital camera interface (DCMI) is a synchronous parallel data bus. It allows easy integration and easy adaptation to specific requirements of an application. The DCMI connects with 8-bit CMOS camera modules and supports a multitude of data formats. The ESP8266 is a low-cost Wi-Fi chip with full TCP/IP stack and microcontroller capability produced by Espressif Systems. The Digilent Pmod interface is used to connect low frequency, low I/O pin count peripheral modules to host controller boards. There are six-pin and twelve-pin versions of the interface defined. The six-pin version provides four digital I/O signal pins, one power pin and one ground pin. The twelve-pin version provides eight I/O signal pins, two power pins and two ground pins. The signals of the twelve-pin version are arranged so that it provides two of the six-pin interfaces stacked. The STM32L496 is ultra low power microcontroller with FlexPowerControl and advanced power supply hardware management. Built-in IDD connector allows verify effetcs of using different low power modes. The STLM75 is a high-precision digital CMOS temperature sensor IC with a sigma-delta temperature-to-digital converter and an I2C-compatible serial digital interface. It is targeted for general applications such as personal computers, system thermal management, electronics equipment, and industrial controllers, and is packaged in the industry standard 8-lead TSSOP and SO8 packages. The device contains a band gap temperature sensor and 9-bit ADC which monitor and digitize the temperature to a resolution up to 0.5°C. The STLM75 is typically accurate to (±3°C - max) over the full temperature measurement range of –55°C to 125°C with ±2°C accuracy in the –25°C to +100°C range. The STLM75 is pin-for-pin and software compatible with the LM75B. The STLM75 is specified for operating at supply voltages from 2.7V to 5.5V. Operating at 3.3V, the supply current is typically (125µA). The on-board sigma-delta analog-to-digital converter (ADC) converts the measured temperature to a digital value that is calibrated in degrees centigrade; for Fahrenheit applications a lookup table or conversion routine is required. The STLM75 is factory-calibrated and requires no external components to measure temperature. The MP23AB02B is a compact, low-power microphone built with a low-profile sensing element. The sensing element, capable of detecting acoustic waves, is manufactured using a specialized silicon micromachining process to produce audio sensors. The MP23AB02B has an acoustic overload point of 125dBSPL with a 64dB signal-to-noise ratio. The MP23AB02B is available in a package compliant with reflow soldering and is guaranteed to operate over an extended temperature range from -40°C to +85°C. The TSV912 operational amplifiers offer low voltage operation and rail-to-rail input and output, as well as an excellent speed/power consumption ratio, providing an 8MHz gainbandwidth product while consuming only 1.1mA maximum at 5V. The op amps are unity gain stable and feature an ultra-low input bias current. The devices are ideal for sensor interfaces, battery-supplied and portable applications, as well as active filtering. The TS4990 is designed for demanding audio applications such as mobile phones to reduce the number of external components. This audio power amplifier is capable of delivering 1.2W of continuous RMS output power into an 8Ω load at 5V. An externally controlled standby mode reduces the supply current to less than 10nA. It also includes an internal thermal shutdown protection. The unity-gain stable amplifier can be configured by external gain setting resistors. USB On-The-Go (USB OTG) is a specification that allows USB devices, such as tablets or smartphones, to act as a host, allowing other USB devices, such as USB flash drives, digital cameras, mice or keyboards, to be attached to them. Use of USB OTG allows those devices to switch back and forth between the roles of host and device. Standard Arduino Uno Rev. 3 shield connector allows using cheap and very popular peripheral shields. KAmod is 4 and 6 pins connector standard, introduced by KAMAMI company, as solution for cheap and easy connection of small peripheral boards/functional expanders for digital and analog systems. 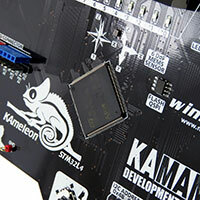 Kameleon Board has built-in ST-Link programmer. It uses SWD interface to program the STM32L4 microcontroller. The ST-Link/V2 is an in-circuit debugger and programmer for the STM32 microcontrollers. The serial wire debugging (SWD) interfaces are used to communicate with any STM32 microcontroller located on an application board. Power ground connectors for measurement clips. 30-pin connector dedicated to Digilent Analog Discovery 2 connection (both analog and digital ports). The Winbond W25Q80DV (8M-bit) Serial Flash memory provides a storage solution for systems with limited space, pins and power. The 25Q series offers flexibility and performance well beyond ordinary Serial Flash devices. They are ideal for code shadowing to RAM, executing code directly from Dual/Quad SPI (XIP) and storing voice, text and data. The device operates on a single 2.7V to 3.6V power supply with current consumption as low as 1µA for power-down. All devices are offered in space-saving packages. The Winbond W25Q80DV array is organized into 4,096 programmable pages of 256-bytes each. 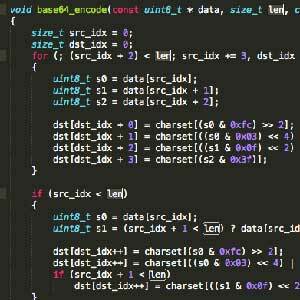 Up to 256 bytes can be programmed at a time. Pages can be erased in groups of 16 (4KB sector erase), groups of 128 (32KB block erase), groups of 256 (64KB block erase) or the entire chip (chip erase). The Winbond W25Q80DV has 256 erasable sectors and 16 erasable blocks respectively. The small 4KB sectors allow for greater flexibility in applications that require data and parameter storage. The Winbond W25Q80DV supports the standard Serial Peripheral Interface (SPI), and a high performance Dual/Quad output as well as Dual/Quad I/O SPI: Serial Clock, Chip Select, Serial Data I/O0 (DI), I/O1 (DO), I/O2 (/WP), and I/O3 (/HOLD). SPI clock frequencies of up to 104MHz are supported allowing equivalent clock rates of 208MHz (104MHz x 2) for Dual I/O and 416MHz (104MHz x 4) for Quad I/O when using the Fast Read Dual/Quad I/O instructions. These transfer rates can outperform standard Asynchronous 8 and 16-bit Parallel Flash memories. A Hold pin, Write Protect pin and programmable write protection, with top, bottom or complement array control, provide further control flexibility. Additionally, the device supports JEDEC standard manufacturer and device identification with a 64-bit Unique Serial Number. Simpliest HMI interface for signalling to the board user microcontroller activity. The OSTBMAS2C1A is a small (PLCC4) but efficient and high luminous RGB LED with typical 30 mA DC forward current. Common cathode OPD-Q5621LA-BW 4-digit LED display has multiplexed configuration and requires 12 lines to control all segments. Connector for popular and widely used, cheap LCD in 2x16 characters matrix.